For professional-grade power and performance, choose Shaver post drivers. Farmers and fencing contractors who build fences for a living will tell you that you can't find a better post driver than a Shaver. Shaver's professional-grade post drivers are engineered for the most demanding jobs, from tough soil conditions to tricky side hills to having the ability to drive a wide variety of post types. In fact, you won't find another company that has spent more time engineering the best post driver in the industry. How do we know? Because we invented and patented the world's first powered post driver more than a half century ago. While Shaver is the only choice for powerful, high-performance post drivers, we give you a choice of drivers to fit your operation. Choose between skid steer loader-mounted drivers or tractor-mounted models. 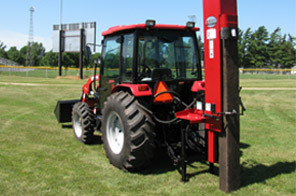 On tractor-mounted models, you have a choice between front- or rear-mounted models. And, you can choose your model based on the pounding power you need and they types of posts you plan to install. Regardless of which model you choose, you can be assured that you'll get the quality that professionals have come to know Shaver for. Trailer mounted post drivers are here: UTD. 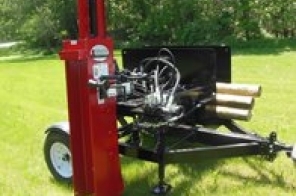 Everything you expect from a Shaver post driver except the springs, blocks or studs.